I’m here to give you all the details on this year’s holiday Crochet-A-Long (CAL) you won’t want to miss! 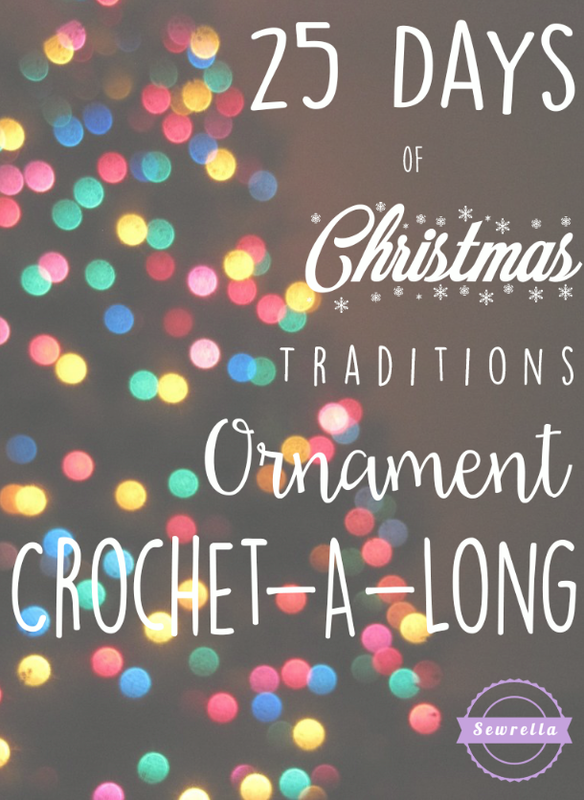 Presenting: The 25 Days of Christmas Traditions Ornament Crochet-A-Long! Beginning the week or September 19, 2016 I will release 2 or 3 FREE crochet ornament patterns each week for 10 weeks. By Thanksgiving, this CAL will wrap up and you will have 25 gorgeous handmade ornaments – yay! Now, there is more fun to this CAL than just making ornaments to slap on your Christmas tree – each ornament will represent a holiday tradition embodying the Christmas spirit. Some traditions are about spending time with family, and some are about love and the spirit of giving. When each ornament pattern is released, the top of the blog post will detail the tradition that accompanies it. During the month of December (after all your ornaments are finished being made), each day I encourage you to choose an ornament and perform its tradition with your family. Then, once you’ve performed the tradition, place the corresponding ornament on your tree! Example: We will make a tiny Christmas tree ornament. On December 1st (when my family traditionally goes to pick out a tree and put it up every year) we will do just that and once it is up, I will place my little crochet tree ornament on my big tree! Some of the traditions are straightforward like this example, and some are more up to you to decide the details (like a random act of kindness). What’s the point of all of this? To encourage all of us to take a step away from the materialism of the holidays, the maxing out of credit cards and the long lists of gifts, and to spend some time each day of December with somebody you love. Even if that somebody is your dog. Give each other the gift of attentive time throughout the month with the help of your new handmade ornaments – put down the phones and the tablets and make Christmas cookies or go ice skating. This CAL is here to help you do that. I hope you enjoy making these ornaments with me, but even more than that I hope you really take to heart the purpose of this CAL – to love one another. And don’t be too worried about time! I know that we are all busier than ever (myself included, my four month old keeps me on my toes) so some of the traditions will be a labor of love and take the better part of a day, while other traditions are as simple as reading a holiday story together. You can stretch out or condense the activities as much as you like – I just encourage you to try your very best to complete every tradition during the month, I promise you’ll be glad you did! Please share photos of your ornaments and family traditions with me by tagging me @Sewrella on Facebook and Instagram! I’d love to see how all of you are progressing with this project. I’ve teamed up with Lion Brand Yarn to bring you a super special Yarn Kit just for this project! Only my readers have access to this Kit and it’s even at a special discount just for you! All the yarn you’ll need for the entire CAL (all 25 ornaments) is included. You have until October 15 to get 20% off all the yarn you need for this project, so go ahead and order the kit before our start date! You can substitute acrylic worsted weight yarn for the 24/7 Cotton but I do not recommend it as this will not produce a timeless, long lasting ornament as the cotton would. Nor will it be as pretty! You will also need some polyfil stuffing. You can find this in the craft store or for super cheap on amazon. You will need one bag for all 25 ornaments. – Many of the ornaments will be made in the amigurumi style (like tiny stuffed animals). Now don’t let this scare you – you don’t need to have any amigurumi experience! If you can single crochet, you can make amigurumi items. Give it a try and I think you’ll be surprised by how easy it is – I was overwhelmed by amigurumi until I gave it a go, and it was a breeze! – I’ve gotten some questions about difficulty level. I will say that you do need a good crochet foundation. You should know single crochet, half double crochet, double crochet, slip stitch, and magic rings (see my Learn to Crochet Page if you need help with these). For any complex types of stitches I will be linking to helpful videos and tutorials so that no one is lost and confused! – I am here to help. Although I will make all of these patterns as easy to follow as possible, I know that some of you will have questions. Feel free to send me a message on Facebook or email me sewrella@yahoo.com and I’ll get back to you as quickly as I can. May your tribe increase. Your generosity in helping people like us, who rely on videos and written patterns is appreciated. May God bless you and keep you enlightened slways.